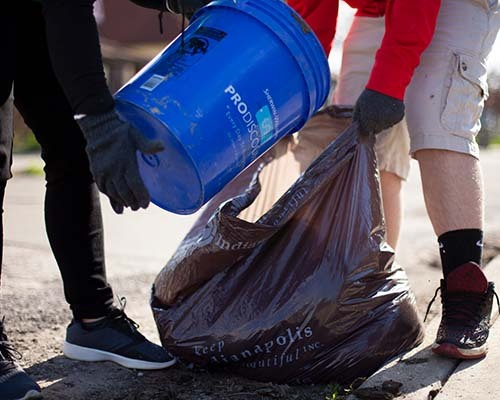 Adopt-A-Block | Keep Indianapolis Beautiful, Inc.
Are you the sort of person who picks up stray scraps of paper when you're on a walk? Are you the person that would pick up trash if you had a litter grabber? Do you lead by example and get your friends and neighbors to help too? Thought so! You're one of us, a KIB Adopt-A-Block Captain. The Adopt-A-Block program empowers you to bring beautification and neighborhood revitalization down to the city's smallest unit, the block. We provide free tools and resources, and you keep your block clean of litter on an ongoing basis. Plus, you get the awesome title "Block Captain" for leading your block's beautification. The Adopt-A-Block program encourages new neighborhood volunteers to participate in community activities. Street by street, neighbors inspire each other by setting an example of environmental and community stewardship, dramatically improving their quality of life. Neighborhoods with high Adopt-A-Block participation are leaders in developing pocket parks, community tree plantings, and vibrant greenspace projects throughout the city. Some form neighborhood watch groups and improve their safety. You can become an Adopt-A-Block captain at home, at school, or where you work. Bring your neighbors together (young and old) to set goals, share the work of beautifying your block, and spend time with each other. Work with your neighbors to keep your block clean, whether that means daily pickup, a weekly cleanup, or a monthly effort. Let your neighbors know about the resources available for your block through Keep Indianapolis Beautiful. From free trainings to trees, we're here to help! Talk to residents about what you're doing when you're out cleaning your block. See if you can recruit new block coordinators on other streets in your neighborhood to expand your impact. Each block coordinator receives a cleanup kit that includes your choice of four items: a broom, shovel, bags, gloves, dustpan, bucket, or litter-grabber. We also host training sessions and social events to help block coordinators collaborate and celebrate their successes. Please stay tuned to see what is coming up! Each block can receive a FREE TREE in the fall through Keep Indianapolis Beautiful's Community Forestry program! To encourage friendly competition, KIB scores each block on a scale of 1 to 4 (1 is good, people). A score of 1 indicates a completely litter-free block. Each spring, blocks with an average of 2 or better can attend a workshop on native plants and receive FREE perennials! Your support through the Adopt-A-Block Business Program means more residents out developing pocket parks, planting community trees, and creating vibrant greenspaces throughout the city. Increase your curb appeal, whether that means daily pickup, a weekly cleanup, or a monthly effort. We suggest cleaning a minimum of every other week. Be a community connecter. Encourage your neighbors, customers, and partners to share in the work of beautifying your block and getting to know each other. Let your customers know about the resources available for your block through Keep Indianapolis Beautiful. From free trainings to trees, we're here to help! Talk to residents about what you're doing when you're out cleaning your block. See if you can recruit new business block captains on other streets to expand your impact. Adopt-A-Block Business Annual Fee: $250 to support growing the Adopt-A-Block network for residents all over the city. To encourage friendly competition, KIB scores blocks once a month on a scale of 1 to 4, with a score of 1 indicating a completely litter-free block. Blocks with an average score of 2 or better are eligible to receive FREE perennials! Each block, regardless of the cleanliness score, can receive a FREE TREE in the fall through Keep Indianapolis Beautiful's Community Forestry program! Schools participating in the Adopt-A-Block program give students hands-on opportunities to engage in civic leadership. Together, students make a visible difference in their communities. Bring your school community together (young and old) to set goals, share the work of beautifying your block, and spend time with each other. Gain the cooperation of students, staff, and parents to keep your block clean, whether that means daily pickup, a weekly cleanup, or a monthly effort. Note: Schools may be scored during school breaks. Let your school community know about the resources available for your block through Keep Indianapolis Beautiful. From free trainings to trees, we're here to help! Each school coordinator receives a cleanup kit that includes a litter-grabber, trash bags, and gloves. We also host training sessions and social events to help block coordinators collaborate and celebrate their successes. Please stay tuned to see what’s coming up! To encourage friendly competition, KIB scores each block on a scale of 1 to 4, with a score of 1 indicating a completely litter-free block. Each spring, blocks with an average of 2 or better are eligible to receive FREE perennials! As an Adopt-A-Block captain, you receive free native perennial flowers and grasses if you keep your block clean. Native plants are mailed to you in October. Check out this video to learn why plants that naturally grow in Indiana are so important! Our Little BIG (Block Improvement Grant) Awards are grants of up to $500 for Adopt-A-Block Captains to coordinate with each other to make their neighborhoods better. Each applicant group must include at least three Adopt-A-Block Captains. This way we can span multiple blocks and help neighbors work together. To read the grant details and apply, please click the link below. Visit these links for helpful information and neighborhood resources. Share Your Successes! Please fill out this Adopt-A-Block spotlight form so we can learn more about you and what you are doing in your neighborhood. We will use these spotlights on our website, in KIB's Get the Dirt newsletter, and in information sent out to Adopt-A-Block coordinators across the city! Adopt-A-Block Handbook: Everything you need to know about the Adopt-A-Block Program! Local Neighborhood Resources: Take a look at the resources available to help you improve your neighborhood. Have a question? Contact Gerardo Ruiz Tovar at gruiztovar@kibi.org or call 317-264-7555 x130.